Delicious, I love chocolate and this is one of the best I've tried. First chocolate vape I enjoyed. I don't really like nutty vapes, but here I don't find it offensive. Good job! This is really good. Tastes exactly as described in reddit notes. 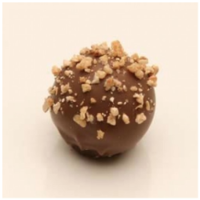 Rich, creamy, sweet and chocolatey with a touch of hazelnut. Recipe is very well done. Right away when I saw this I mixed up 100ml's, since I've had a bit of mixer block and didn't want to make any of my stuff I judge this purely based on the flavors in it and assumed it would be good. Boy was I not let down. This is super sweet and smooth which just some hints of nuttiness, perfect for the time of year and for what I was craving. FLV milk chocolate is still more than enough to make this plenty chocolaty without it killing everything else in the recipe. Killer work man, chocolate vapes aren't easy and you nailed this.